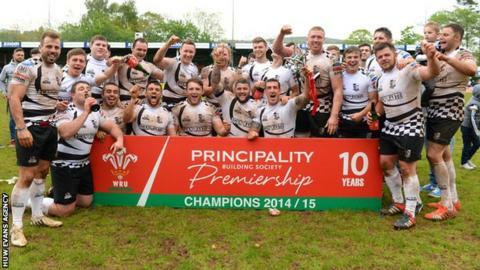 The Welsh Premiership will split mid-way through the season from 2016-17. The eight-eight split will be decided by league positions based on results in the first half of the season. The Welsh Rugby Union announced in June that the top division in domestic Welsh rugby will expand from 12 to 16 teams from 2016-17. The WRU says its board has also agreed to a "full review of the structure and finances" over the first three seasons of the enlarged league. Welsh rugby's governing body has already said that there will be no relegation from the semi-pro Premiership at the end of 2015-16 or for the following three seasons. The absence of a mid-season split in the original announcement of the division's expansion had been criticised by Welsh Premiership chairman Chris Clarke. While that issue has been addressed, Clarke has also expressed his concern at the lack of end of season play-offs to decide title and relegation issues, as well as funding issues. Another area of contention with some of the clubs is the WRU's decision to no longer enter Premiership clubs in the British and Irish Cup. Instead combined regional/club sides under the umbrella of Cardiff Blues, Ospreys, Scarlets and Newport Gwent Dragons will compete in the competition from 2015-16.